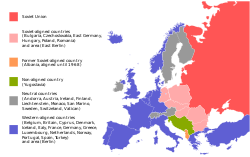 The term Eastern Bloc referred to the former Communist states of Eastern and Central Europe, including the countries of the Warsaw Pact, along with Yugoslavia and Albania, which were not aligned with the Soviet Union after 1948 and 1960 respectively. The Council for Mutual Economic Assistance (COMECON) arranged economic cooperation among the members. Communist governments were initially installed, mostly in places that had been controlled by the Axis countries and occupied due to the victories of the Soviet Union on the Eastern Front (World War II). The process included extensive political and media controls, along with a Soviet approach to restricting emigration. Events such as the split of Josip Broz Tito and Berlin Blockade prompted stricter control. While certain oppositional factions in the Bloc had revolts, such as the Hungarian Revolution of 1956 and the Warsaw Pact invasion of Czechoslovakia, Mikhail Gorbachev's perestroika experienced inefficiencies and stagnation throughout much of the Bloc preceding the Bloc's dissolution. Counterrevolutions in 1989 dissolved the Soviet Bloc. A 2009 Pew Research Center poll showed that 72% of Hungarians and 62% of both Ukrainians and Bulgarians felt that their lives were worse off after 1989, when free markets were made dominant. A follow-up poll by Pew Research Center in 2011 showed that 45% of Lithuanians, 42% of Russians, and 34% of Ukrainians approved of the change to a market economy. ↑ "End of Communism Cheered but Now with More Reservations". Pew Research Center's Global Attitudes Project. 2009-11-02. Retrieved 2018-05-14. ↑ "Confidence in Democracy and Capitalism Wanes in Former Soviet Union". Pew Research Center's Global Attitudes Project. 2011-12-05. Retrieved 2018-05-14. This page was last changed on 28 November 2018, at 04:14.